Chocolate S’mores Cookies with a fudgy, chocolate cookie base studded with chocolate chips, topped with graham crackers and marshmallows, toasted and finished with a drizzled of chocolate. There’s a little gourmet cookie store, Over The Top Gourmet Cookies, near where I live that makes fabulous cookies. Occasionally, when I get a craving for one of their lemon cookies and I don’t have time to bake them, I stop and buy one. The other day when I stopped to buy some lemon cookies to share with my neighbor, they also had a S’mores and More Cookie that I couldn’t resist buying. My neighbor and I fell in love with their S’mores cookie, and I decided to recreate it at home. I used my favorite chocolate cookie recipe as the base of the cookies. I undercooked them slightly, then took them out of the oven, added the marshmallows and the grahams and put them back in the oven to broil them for a minute or two to toast the marshmallows. You have to remember to switch the oven back 350° before you bake the next batch. If you have double ovens, you can use the broiler for toasting the marshmallows in one oven and the second oven for baking the cookies. I don’t have double ovens, but I’d love to one day. This cookie is fabulous! My family went crazy over it too. 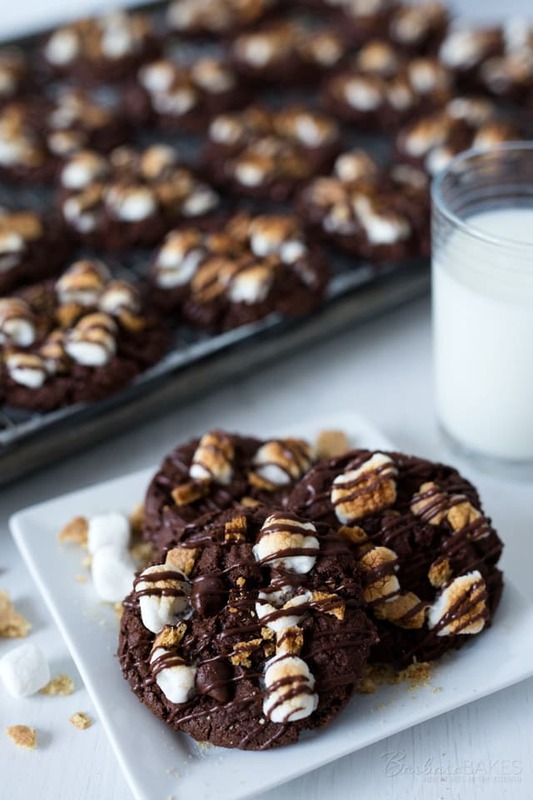 The cookie is a rich, chewy chocolate cookie and the graham crackers add an extra crunch and the marshmallows an additional layer of chewiness. You definitely need to make these soon. In medium bowl, whisk together flour, cocoa, baking soda, and salt. Add flour mixture and mix on low speed just until blended. Stir in 1 cup chocolate chips. Using a small cookie scoop, drop by rounded scoops on to cookie sheets. Bake for 8 minutes, until edges are set, but still soft in center. Remove cookie sheet from the oven and top each cookie with a few marshmallows and graham cracker pieces. Turn the oven to broil. Put the cookies under the broiler until the marshmallows start to brown, 1 to 2 minutes. Set oven temperature back to 350°. Repeat with remaining cookie batter. Let cookies cool on the cookie tray for five minutes. Remove cookies to a wire rack to cool completely before icing. In a small microwave safe bowl, melt remaining 1/2 cup chocolate chips and coconut oil or shortening for 30 seconds. Stir and continue microwaving until chocolate is melted and smooth. 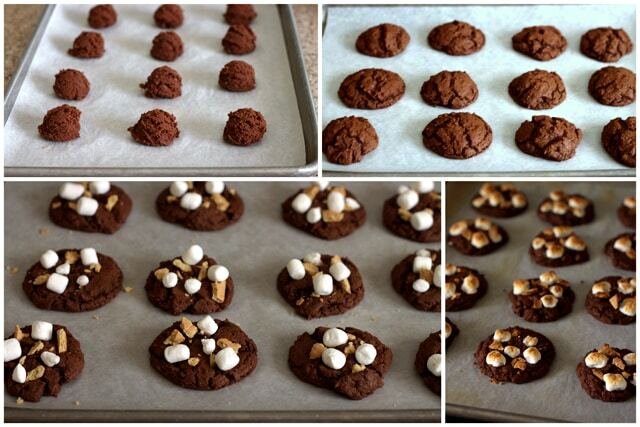 Drizzle chocolate over the top of the marshmallows and graham cracker pieces on the cookies. 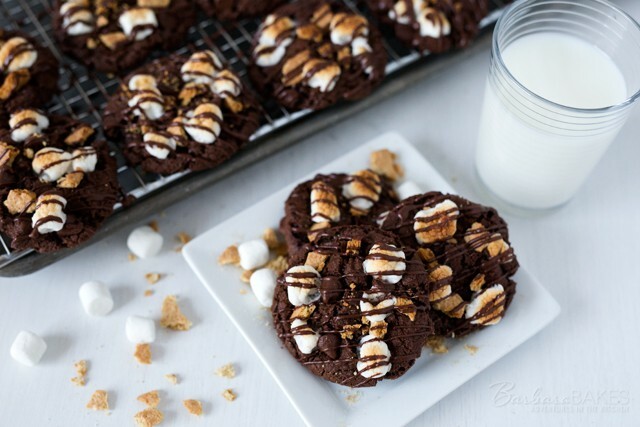 I’m thinking of making some S’mores to add to the sweetness of the month of February and I think these S’mores cookies of yours would be perfect! It looks so inviting and delish! In the dictionary under OMG: these cookies are there!!! These cookies look adorable. They rival any specialty cookies shop’s cookie. I could eat a whole batch of these! YUM!!! These cookies look incredible! I love everything with marshmallows!! They would be fun to take camping with the grandkids. Maybe then we wouldn’t have to clean up melted marshmallow. The biggest regret I have in building my house was not putting in double ovens. Yummy! They look cute and delicious! What perfect cookies…oh my they look heavenly! These look completely delicious, plus so much fun! These are magical Barbara! I love all things smores but chocolate smores cookies look incredible! These would be perfect for a Labor Day party—of course, I’m not sure my family would let me share these gems with anyone else 🙂 They look amazing! Fabulous cookies! So pretty and surely extremely delicious.